11.693 km by bicycle. 94 days on the bike. And it is a race! OK, that does sound quite bad. Still, looking forward to it! Having arranged four months of unpaid leave (thank you! ), other preparations are now on; packing list, spare parts, insurance, flights, setting up a blog... and training. A lot of training. Still a lot of time for that; the start will be on the 10th of January 2014 in Khartoum, the capital of Sudan. Usually, the tour starts in Cairo, but due to the political situation in Egypt, the start has been shifted to Khartoum this year, but an extra tour into the Nubic Desert and northern Ethiopia will make sure we'll still cover the same distance. 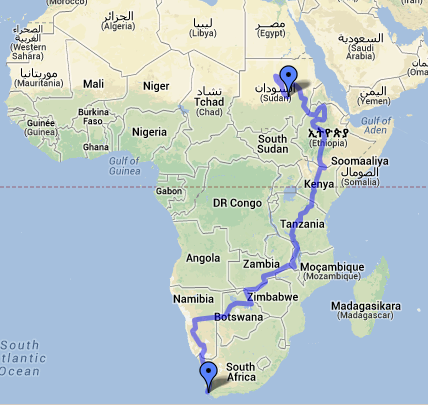 I will be riding with the Canadian company Tour d'Afrique. More detailed information on the route and organisation can be found on their website in the section on the Tour d'Afrique. 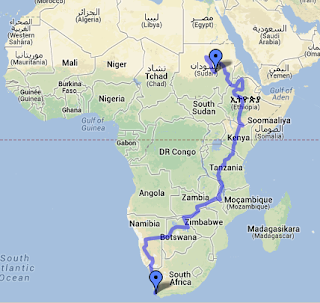 I will be riding my reliable Trek 8000 WSD mountainbike, with some modifications to make it even more Africa proof. O, and registration is still open, just in case you want to join!